(Francisco Kjolseth | The Salt Lake Tribune) Citizens meet at Foxboro Elementary School in North Salt Lake on Wed. March 20, 2019, to discuss the neighborhood's future now that adjacent Legacy Parkway will allow big-rig trucks and have a higher speed limit beginning Jan. 1. The Legislature rejected bills to extend the truck ban. (Francisco Kjolseth | The Salt Lake Tribune) Foxboro resident Angie Keeton leads a citizens meeting at Foxboro Elementary School in North Salt Lake on Wed. March 20, 2019, to discuss the neighborhood's future now that adjacent Legacy Parkway will allow big-rig trucks and have a higher speed limit beginning Jan. 1. The Legislature rejected bills to extend the truck ban. (Francisco Kjolseth | The Salt Lake Tribune) Jason Davis, UDOT Deputy Director of Engineering and Operations reveals the findings of a study that expects a nearly 50 percent increase in traffic when the speed limit is raised on Legacy Parkway. 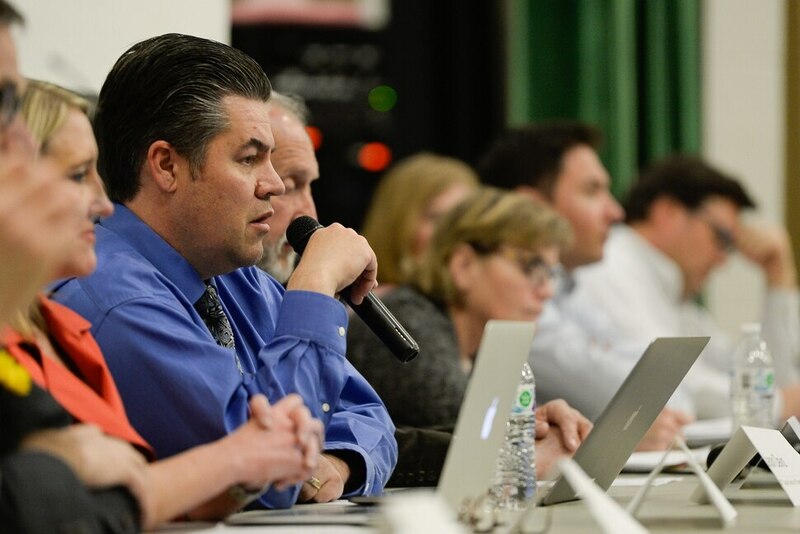 Citizens gathered at Foxboro Elementary School in North Salt Lake on Wed. March 20, 2019, to discuss the neighborhood's future now that adjacent Legacy Parkway will allow big-rig trucks and have a higher speed limit beginning Jan. 1. The Legislature rejected bills to extend the truck ban. (Francisco Kjolseth | The Salt Lake Tribune) Citizens meet at Foxboro Elementary School in North Salt Lake on Wed. March 20, 2019, to discuss the neighborhood's future now that adjacent Legacy Parkway will allow big-rig trucks and have a higher speed limit beginning Jan. 1. The Legislature rejected bills to extend the truck ban. 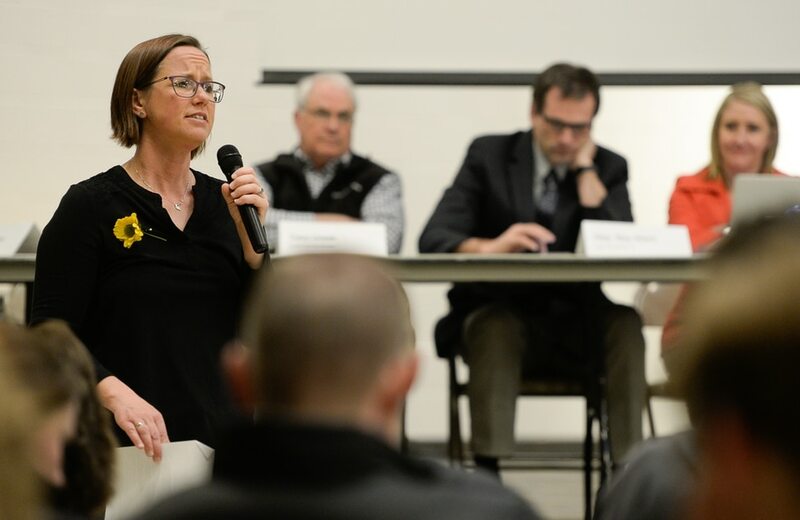 (Francisco Kjolseth | The Salt Lake Tribune) Rep. Melissa Ballard of Utah House District 20, addresses citizens gathered at Foxboro Elementary School in North Salt Lake on Wed. March 20, 2019, to discuss the neighborhood's future now that adjacent Legacy Parkway will allow big-rig trucks and have a higher speed limit beginning Jan. 1. The Legislature rejected bills to extend the truck ban. (Francisco Kjolseth | The Salt Lake Tribune) Citizens post their questions and ideas on the wall as they meet at Foxboro Elementary School in North Salt Lake on Wed. March 20, 2019, to discuss the neighborhood's future now that adjacent Legacy Parkway will allow big-rig trucks and have a higher speed limit beginning Jan. 1. The Legislature rejected bills to extend the truck ban. Residents near Legacy Parkway are not yet surrendering in a battle to keep the roadway more like a scenic country lane than another noisy, air-polluting Interstate 15. 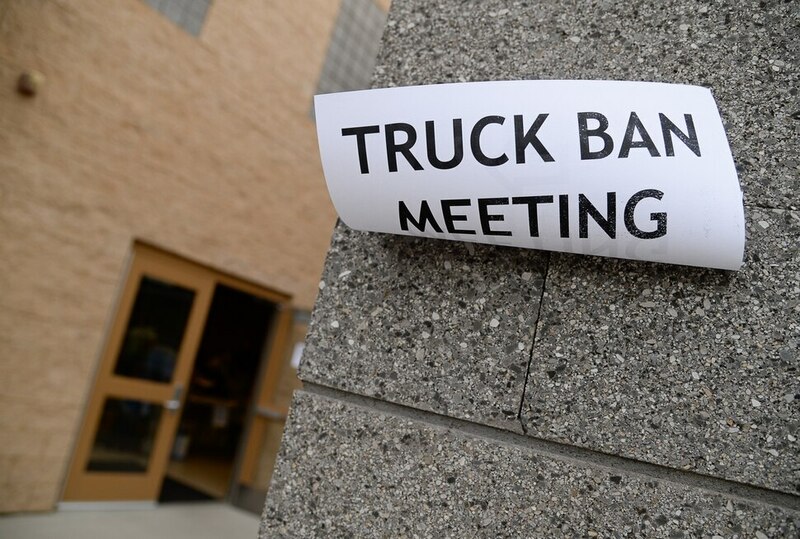 About 100 people gathered Wednesday night at North Salt Lake’s Foxboro Elementary, adjacent to the parkway, to try to figure out what might be possible now that the Legislature rejected bills to extend its longtime ban on big-rig trucks there. Options discussed include pushing state officials to reconsider, seeking to make the road as livable as possible amid changes, staging protests or perhaps filing lawsuits. “I’m in. I’m willing to keep going” to fight to keep the big-rig ban and protect the area, said Angie Keeton, organizer of the meeting that drew local legislators and city leaders in addition to residents. The deal also imposed a 55 mph speed limit, allowed only two lanes in each direction and mandated more quiet pavement to dampen sound — all to protect adjacent wetlands and wildlife. It also has included a system of trails, and needed no sound walls that block views. The deal likely expires Jan. 1, but many residents said they did not know about the temporary status when they bought homes nearby to enjoy views and trails offered by Legacy. 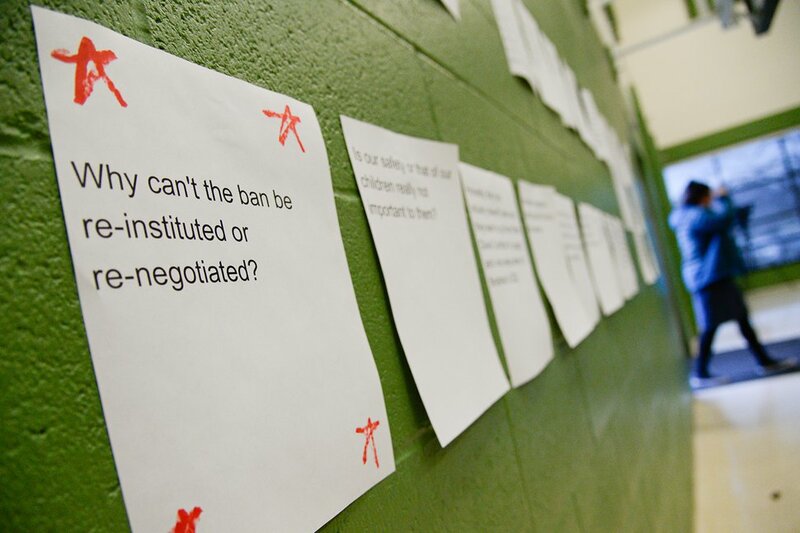 (Francisco Kjolseth | The Salt Lake Tribune) Citizens post their questions and ideas on the wall as they meet at Foxboro Elementary School in North Salt Lake on Wed. March 20, 2019, to discuss the neighborhood's future now that adjacent Legacy Parkway will allow big-rig trucks and have a higher speed limit beginning Jan. 1. The Legislature rejected bills to extend the truck ban. • Try to persuade state officials that deals that permit lifting the truck ban next Jan. 1 don't actually mandate that it happen, and they could choose to do a review about whether it should be kept. Among those who like that last option is Roger Borgenicht, co-chairman of Utahns for Better Transportation, one of the environmental groups involved in the old court cases that led to making Legacy a parkway. He insists the old deal and its documents simply call for a review in 2020 about whether to remove the truck ban or the 55 mph speed limit, and that such moves were not intended to be automatic — although the Utah Trucking Association contends the opposite, and says it has been waiting patiently for a promised truck ban to be lifted. Borgenicht said there “might need to be a legal remedy” by a lawsuit to force a review of the truck ban instead of automatic removal. “But I hate lawsuits. They are long and expensive acrimony,” he said, adding he hopes groups can simply persuade state officials that changing Legacy is not wise nor mandatory. Keeton said other options include pushing for truck bans in certain hours of the day, ban carrying hazardous materials there or putting on weight limits to keep out some trucks that would especially hurt existing pavement. Jason Davis, deputy director of the Utah Department of Transportation, told the group that a new study shows what Legacy could look like with coming changes. “One of the things that surprised me is the biggest change you are going to see is if the speed limit changes, there will be an increase of nearly 50 percent” in the number of vehicles that use the parkway daily — drawn by the higher speeds and quicker commutes. (Francisco Kjolseth | The Salt Lake Tribune) Jason Davis, UDOT Deputy Director of Engineering and Operations reveals the findings of a study that expects a nearly 50 percent increase in traffic when the speed limit is raised on Legacy Parkway. Citizens gathered at Foxboro Elementary School in North Salt Lake on Wed. March 20, 2019, to discuss the neighborhood's future now that adjacent Legacy Parkway will allow big-rig trucks and have a higher speed limit beginning Jan. 1. The Legislature rejected bills to extend the truck ban. Davis said the study also predicts that lifting the ban on big rigs will result in an extra 5,000 to 6,000 trucks a day. He said UDOT would be willing to put in more safety barriers or rails — likely concrete — to help keep the greater traffic away from trails or homes, but it could affect scenic views. Davis vowed that UDOT would continue to use asphalt on Legacy, instead of more noisy concrete. “We took our best shot. We knew it was an uphill battle,” said Sen. Todd Weiler, R-Woods Cross, who had sponsored one of the bills seeking to extend the truck ban. He said any legislative remedy is now dead. But Rep. Melissa Ballard, R-North Salt Lake, suggested trying to mitigate effects by supporting efforts not to center the new proposed inland port just in Salt Lake County, but to allow arms of it to operate in Ogden or southern Utah. She said that could reduce demand for trucks to use Legacy.